Hey everyone! 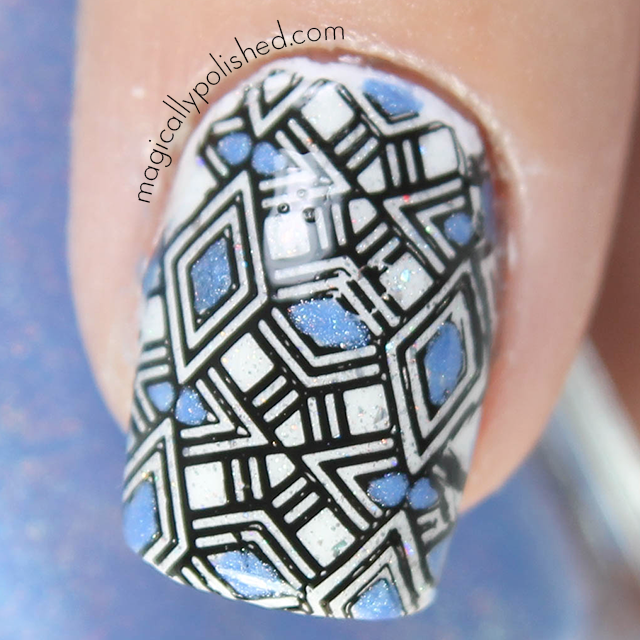 I'm uber excited today (or more like a couple of weeks ) to finally show you guys what I had been keeping under wraps...a stamping plate! 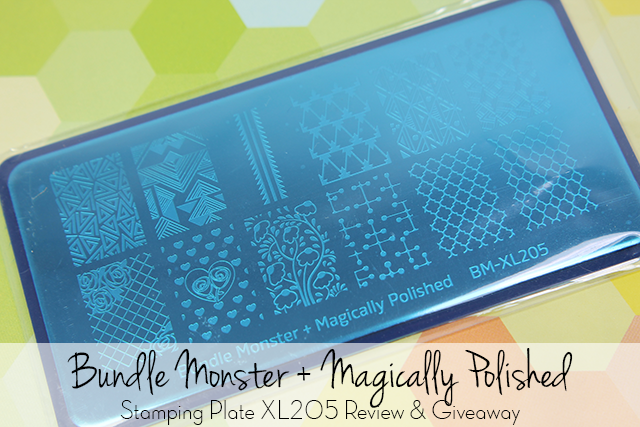 Several months ago I was given an amazing opportunity to collab with Bundle Monster to create my own stamping plate. Of-course I said "yes" and couldn't miss out this great accomplishment for my blog. Bundle Monster stamping plates are stainless steal and the images always turn out neat. For this plate, I wanted to create/have unique and fun designs! Some were inspired by prints I saved on my pinterest page and some created by me using my very own designs. I was so excited to see how the prints turn out and love it! The first look I created was inspired by a print I saved for a long time. At first I wanted to create it free hand, but I thought this pattern is fun for everyone to use and has that tribal look (which I loved). I used Bonita Salon polishes and reverse stamping technique. This was another pattern I was inspired by looking through online and though it will be a great addition to the stamping plate. I love geometric prints and this one was my top design to use. I used the stamping reverse technique and Enchanted Polish Reign Beau and the base is BMC Angelic White. I was so excited mostly for this look! I couldn't help myself by adding of this designs, I was getting sick and tired of see the nail vinyls and none on a stamping plate. 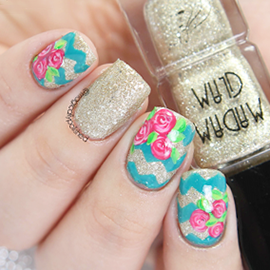 Sometimes you just want to create this look the easiest way possible, in my opinion. Looove how these came out! I love florals and this print was another inspired print online. This was another design I waned t create freehand, but I thought why not add it to the plate. 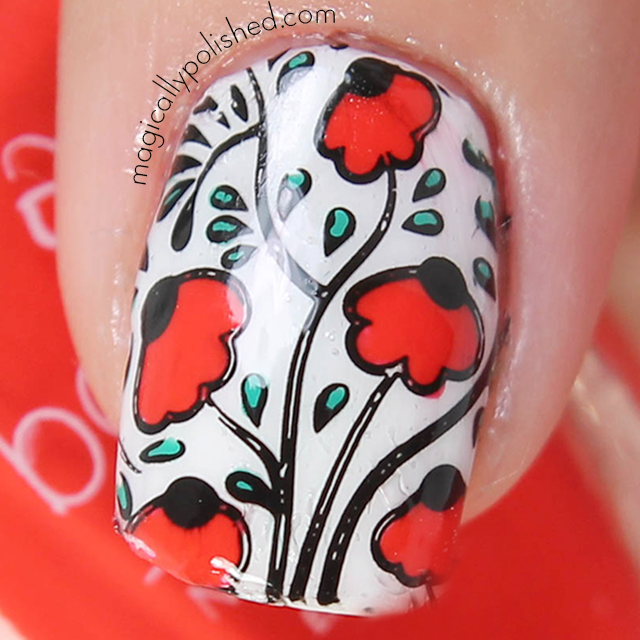 I used BMC Angelic White for the base and Noir Black for the stamping, and Bonita Colors for the florals and leaves. To be chosen among amazing and talent fellow bloggers, this was truly a dream come true. 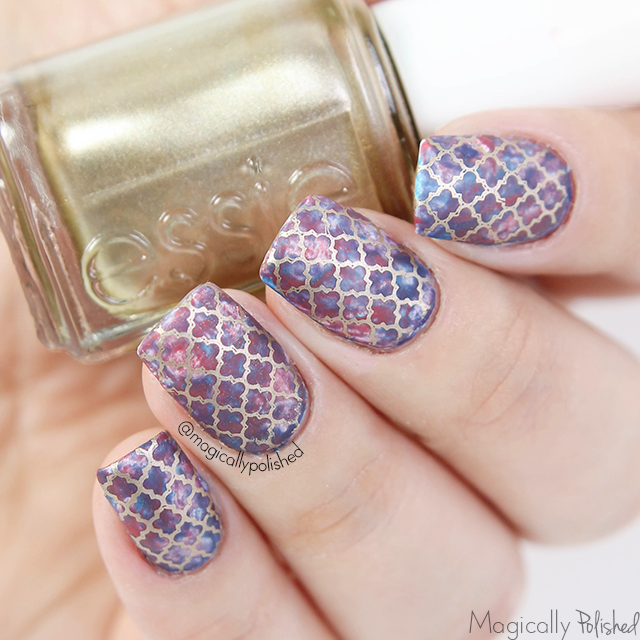 Overall the stamping came out perfectly and I hope you guys really enjoy like I did! 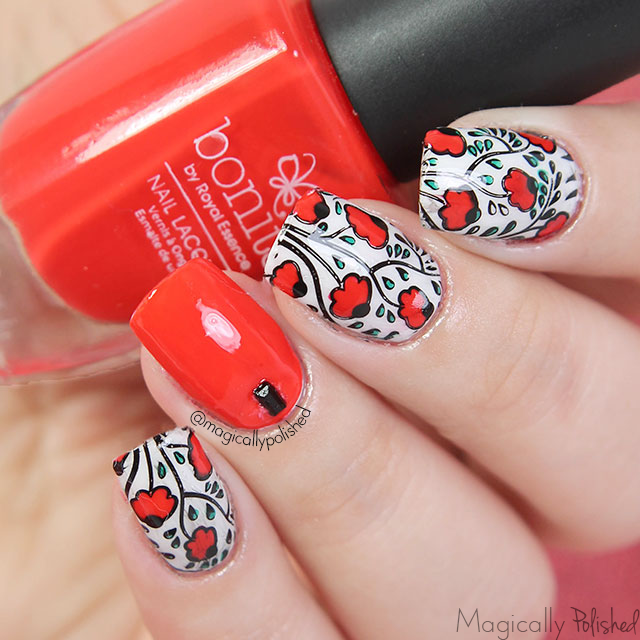 The Blogger Collaboration stamping plates will be released in two sets of five plates each. The first set is now available now at Bundle Monster website and the next sets next week (keep a look out)! You also can now buy them individually for 4.99 each or the entire set of five plates for $19.99. The giveaway starts today and ends on November 22nd. Must be 18 and older! The winner will be announced on my blog on November 22nd. The winner will be contacted by me and will then have 24 hours to respond or a new winner will be chosen.